Most of the known mushroom species fit into the gilled mushrooms order called Agarics. 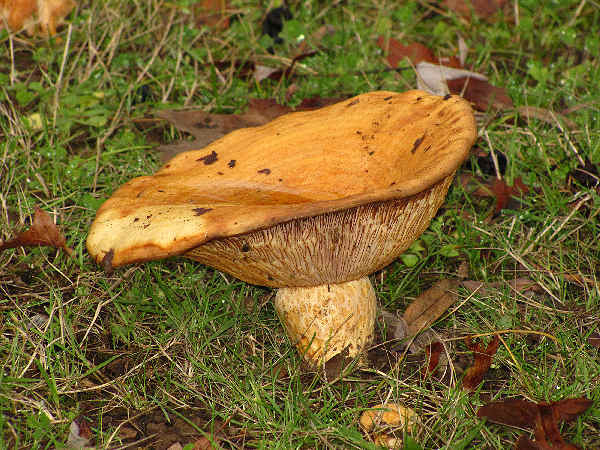 It divides into multiple families, from the very common lawn mushrooms, to the poisonous Amanita, to the small and sometimes colorful groups such as fairy helmets and waxy caps. 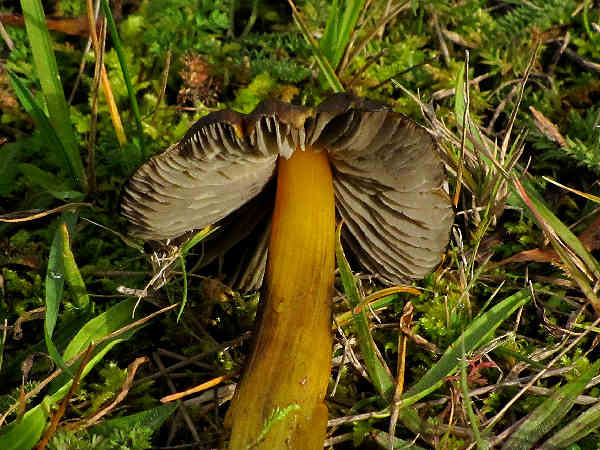 This gallery provides gilled mushroom pictures and information covering a representative species in the category. Walking out the back door and looking at some lawn mushrooms starts the identification guide. 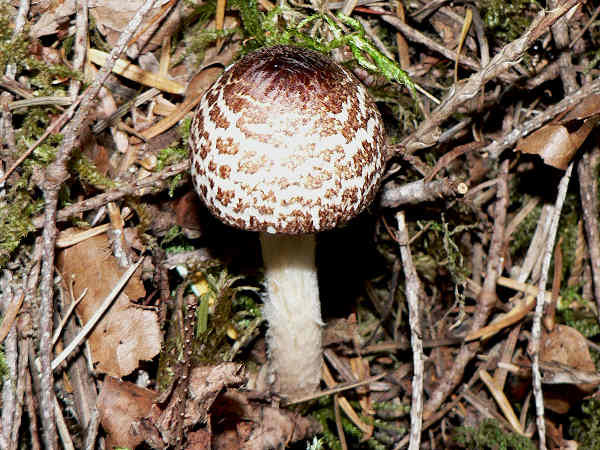 The light to white color caps, ring on the stem, bulbous stem and brown gills suggests a species in the Agaricus genus. Many of the species go by common names such as grass or meadow mushrooms. Cortinarius, the world’s largest genus of mushrooms, gets its name from the partial veil that covers the cap of the young fruiting bodies. 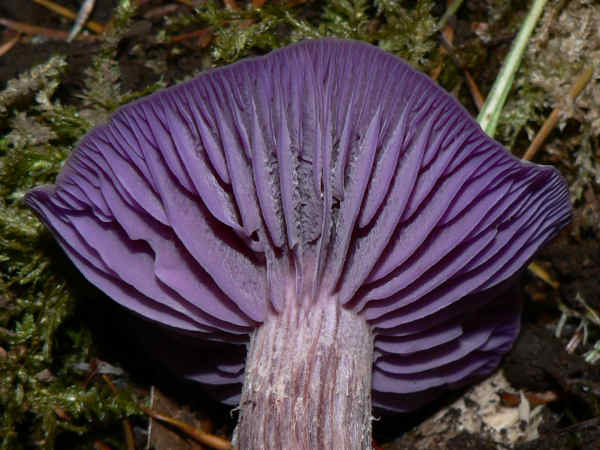 The presence of lamellulae, or short gills also provides a good field ID clue for Cortinarius species. The picture shows a purple cort. Amanita refers to both the mushrooms in the family Amanitaceae as well as the specific mushrooms within the Amanita genus. 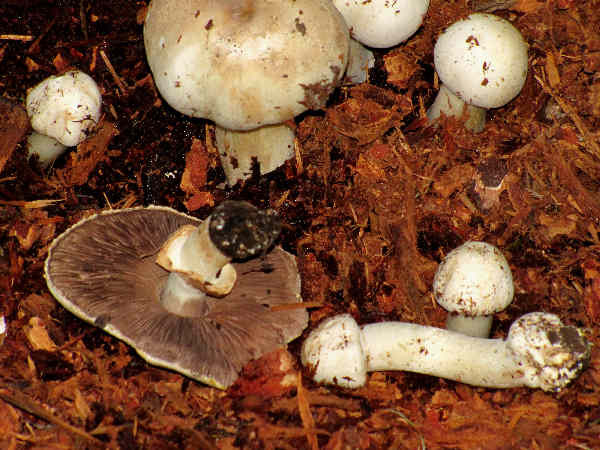 The over one hundred documented North American species share physical characteristics such as the presence of a veil that covers the mushroom during the maturation process, with veil remnants visible on the fungi’s mature caps. 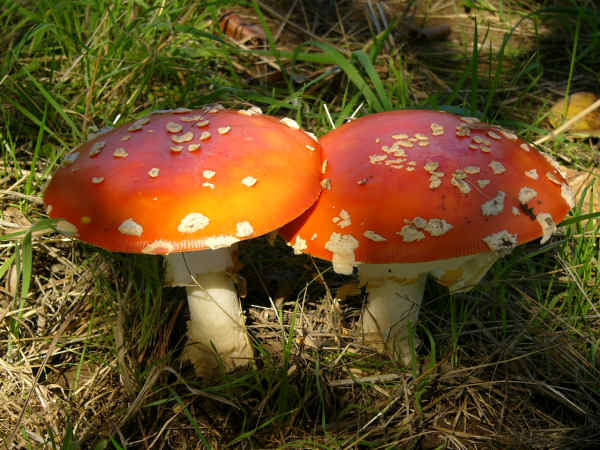 Fly Agaric, the common name for Amanita muscaria, is recognized by the orange spotted top. Mycena, (Fairy Helmets) rank as some of the most colorful and smallest mushrooms seen growing on forest floors. With over two hundred identified species, identifying any particular species can be difficult. It’s best to enjoy them as the small, thin purple, red, yellow, brown and orange mushrooms. 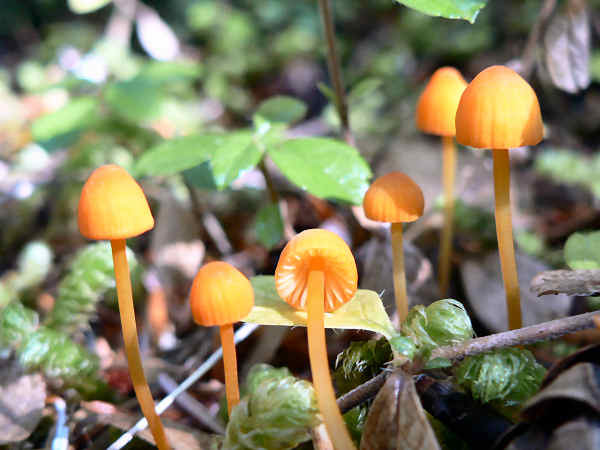 The picture might shows mycena strobilinoides, a bright orange species found growing in the forests of the Pacific Northwest. 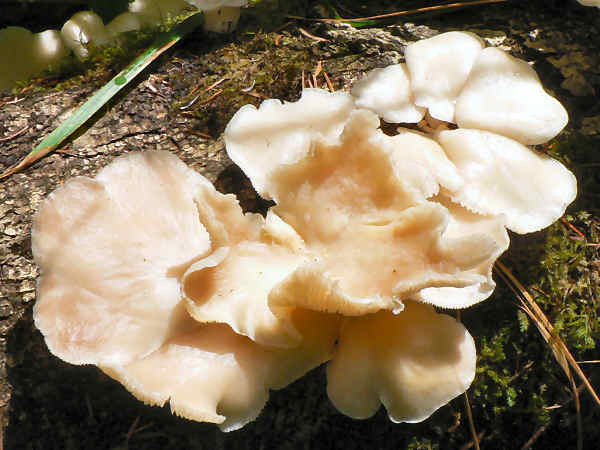 Oyster mushroom refers to a variety of gilled mushroom species that grow like shelves on trees. Commercial growers around the world love them because they are very easy to grow edibles. Pleurotus-ostreatus, pictured, grow in bunches. Their caps can look either fan shaped, like the caps in the picture, or they can look shell shaped, depending on the angle they are growing vis a vis their tree host. Pleurotus-ostreatus is one of a handful of mushrooms that eat nematodes, which makes them an excellent natural pest control research subject. 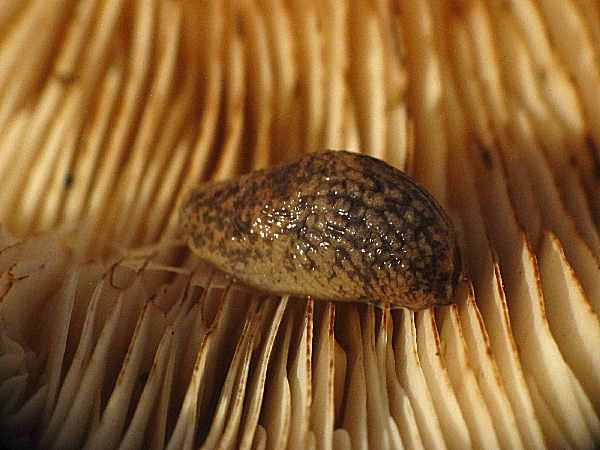 Depending on the area, Milky Caps (genus Lactarius) can be present in both backyards and forested areas. They grow in association with both conifer and hardwood trees, explaining the multiple species present in any area. There are two great ways to identify a Lactarius species. First, when the gills are disturbed they produce a latex like substance that resembles milk (or a different color depending on the species). Physical identification clues using cap and stem start with the fact that most caps are medium sized and normally some shade of brown. The depressed center of the cap often gives the mushroom the look of a cup. The stem is typically very sturdy and a similar color as the cap. 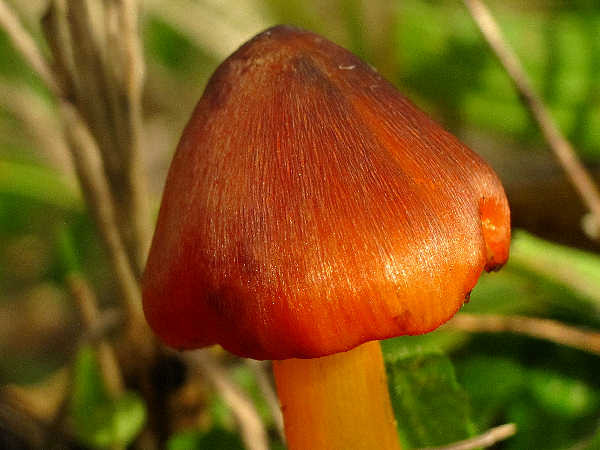 Mushrooms in the genus Hygrocybe are mostly small and colourful. They grow on the ground, often in wooded areas, in the late summer and early fall. They are commonly called Waxy Caps (or Waxcaps) because of their wax-like appearance and feel. The genus consists of many species that are difficult to tell apart. The picture shows the fairly easy to recognice witch’s hat mushroom (Hygrocybe conica) . It is colorful and small in size. When young they have a conical cap so they are sometimes called conic waxycaps. As they age, their caps blacken, leading many to call them blackening waxy caps.When spotting a small, gilled mushroom in the grass that has a dark color cap indicating the mushroom is decomposing, think Inky Caps (family Coprinaceas). 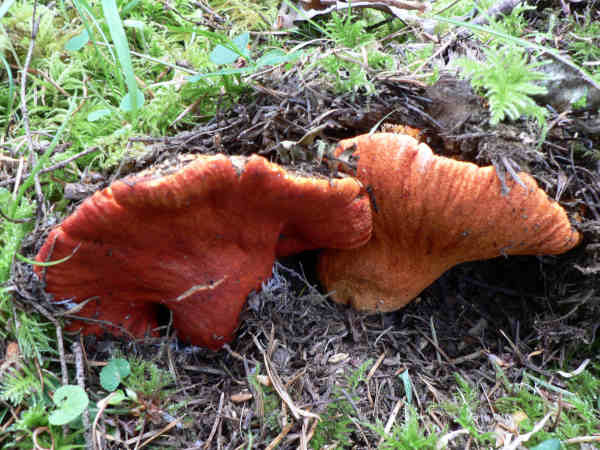 Lobster Mushrooms (Hypomyces Lactifluorum) develop when another fungus grows on the Russula or Lactarius mushroom. As it develops, gills of the host mushroom disappear. Their bright orange color insures easy identification in the wild. Normally the top of the mushroom cap protrudes slightly above soil height, covered by leaves or other forest ground cover. Common throughout many areas of North America, they can often be found on forest edges near paths and roads. In some coastal mountain areas of the Pacific Northwest, literally hundreds can be found growing on the edges of a two mile loop trail. They are considered a choice edible, although all mycologists recommend caution harvesting them in the wild. It is not always easy to determine the original host species.